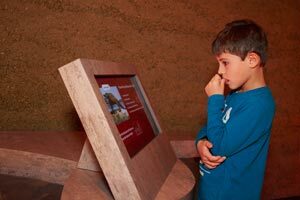 Educational activities are organised around 3 themes at Paleospace: palaeontology, astronomy and the fauna and flora of the marsh. ⇒ Unguided Visits : the group, accompanied by their teacher, look around the museum at their own pace visiting the various areas. Treasure hunt leaflets (available upon request) help to structure the visit. 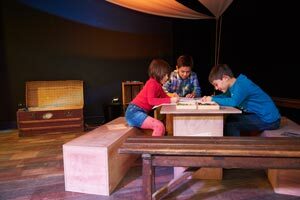 ⇒ Visits with an audio guide in English : provide pupils with an interactive experience whereby they can choose amongst over 30 commentaries and find their way round in their own time. ⇒ Guided tour of LES VACHES NOIRES CLIFFS : exploration and explanation of the geological site, collecting and identifying fossils. First year nursery school to first grade. 2 hrs - 1 class - 4.70 € each. ⇒ Guided tour of THE MARSH : Discover the fauna and flora of the marsh: Look at the plant and animal life, that which lives in the water, and that which lives in the air and on land. First year nursery school to first grade. 1 ½ hrs - 1 class - 4.70 € each. 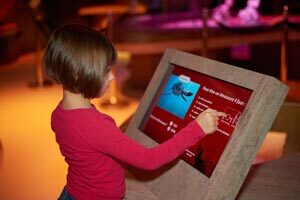 ⇒ Jurassic Odyssey guided tour : Interactive guided tour of the museum with various aids (images & fossils). First year nursery school to first grade. 1 ½ hrs - 1 class - 4.70 € each. ⇒ Jurassic Odyssey guided tour : Guided tour of the museum discovering animals from the seas of the Jurassic period. 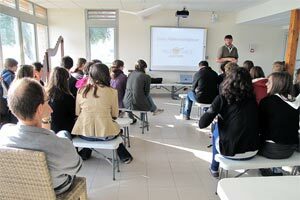 Pupils are called upon to participate throughout the tour by an accompanying scientist. 1 hr - 1 class - 4.70 € each. ⇒ Guided tour of THE MARSH : Discover the fauna and flora of a wetland. 1 ½ hrs - 1 class - 4.70 € each. 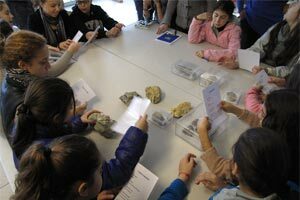 ⇒ LES VACHES NOIRES CLIFFS FOSSILS WORKSHOP : Act the apprentice palaeontologist: drawing, comparison, identifying fossils. 1 hr - 1 class - 5.00 € each. ⇒ Jurassic Odyssey guided tour : Exploring the geology and palaeontology of the Jurassic Period. 1 hr - 1 class - 4.70 € each. ⇒ Guided tour of LES VACHES NOIRES CLIFFS : An introduction to geology on the ground: observation of rocks, cross section drawing, analysis of erosion and collecting fossils. 2 hr - 1 class - 4.70 € each. ⇒ Guided tour of THE MARSH : Find out about the fragile eco-system of a wetland. 1 ½ hrs - 1 class - 4.70 € each. All these activities must be booked in advance for groups of 15 pupils or more.1 group leader free for every 15 pupils. To request a quote, please fill out form . Graceful booking the picnic room ?